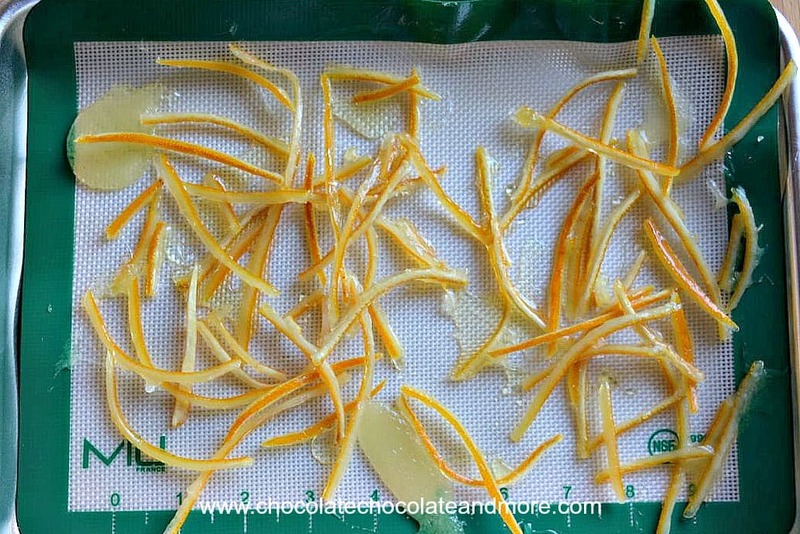 Candied Citrus Peel - Chocolate Chocolate and More! Candied Citrus Peel is easy to make and a great way to use left over citrus peels. 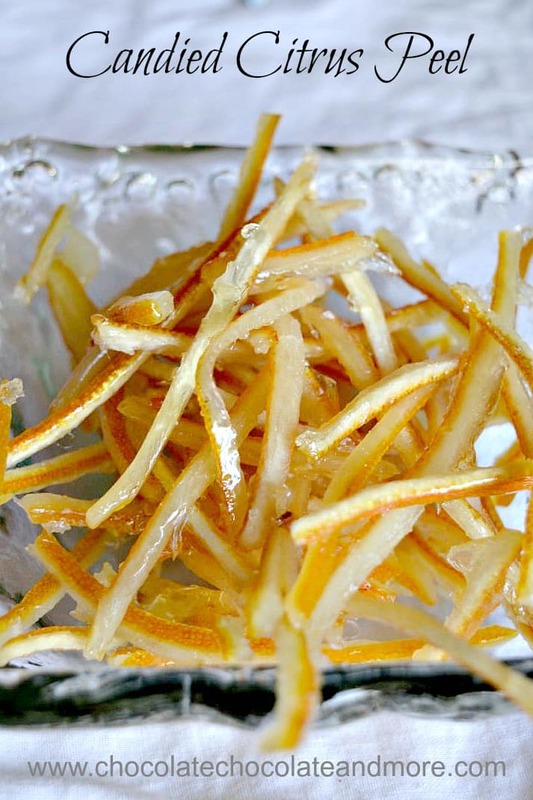 Candied citrus peel is delightful to eat by itself or can be used in other baked goods. My daughter was the pickiest eater when she was small. It started early when she refused to take a bottle no matter what type we tried or what was in the bottle. She weaned straight to a cup. When she was teething, I decided to try biscotti as an alternative to teething biscuits. She didn’t like the biscotti either but all my friends did. Because my friends loved biscotti, I bought a biscotti cookbook. It included a recipe for candied orange peel. I don’t know why as they didn’t use it in anything. However, this candied citrus peel recipe turned into an easy way to stock my kitchen with preserved citrus and ginger ever since. My kids love fresh grapefruit so I had a lot of grapefruit peel and decided to try the recipe. Their recipe made a LOT of citrus peel. I gave most of it to older friends who said they’d enjoyed candied citrus peel as children. You can use any kind of citrus peel. Lemons, limes, oranges, grapefruits all make beautiful peel. You can also use this recipe to make crystalized ginger. You can add candied citrus peel to cookies, biscotti, ice-cream, and other candies or just eat it by itself. The key is to not have too much of the rind attached to the peel. The peel contains the essential oils but the rind is bitter. To candy the peel, just slice it thin and boil in sugar water. Lay the peel out on a silpat mat to cool. If you want, you can also pour disks of the remaining sugar syrup into disks. They will harden into orange-flavored candy. 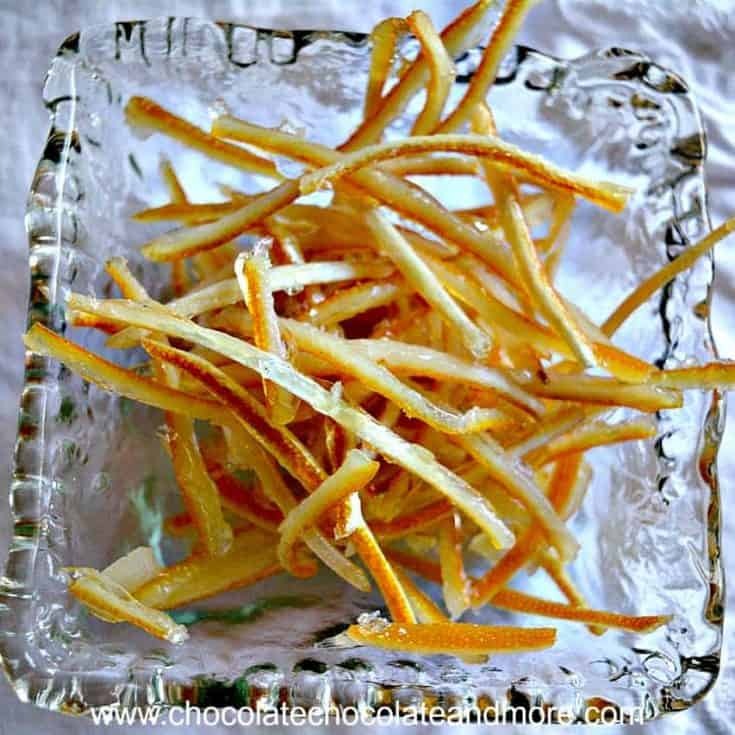 Dip the ends of your candied citrus peel in chocolate or sprinkle on melted chocolate for bark. Use whole or chop candied citrus peel for garnish. Put a slice in your hot tea when you don’t have fresh lemons available. Put sugar and water into a saucepan. Cook on medium heat until sugar dissolves and mixture starts to boil. Add thinly sliced citrus peel. Boil for 10 minutes. Use tongs to remove citrus peel and spread on a silpat mat. If desired, pour disks of the candy syrup onto the mat. Let cool and then further separate peels. Store in a dry container. You can also use this to make crystallized ginger. Just slice fresh, peeled ginger into thin slices and follow the rest of the recipe. You can use candied citrus peel to garnish these orange creamsicle truffles.